I was making a regular a rounds to my favorite blogs when I stumble upon this particular blog. 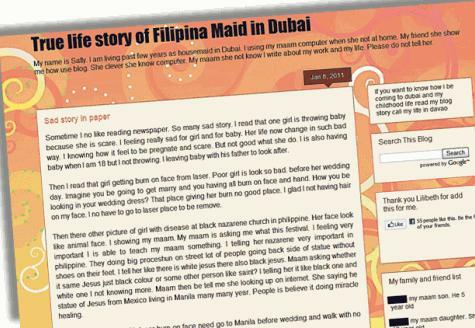 This is about Life story of a Filipina Housemaid in Dubai who used her Boss’s (Maams) computer to manage her blog and share her stories. At first, I’m wondering if she (Sally) is the real Author of this blog, until I noticed the disclaimer stated that the author is actually not Sally. He/She just mimic the character of her. It is actually written in not so good English (just like mine) 🙂 but you can clearly understand every bit of it. What is so special about her articles are the moral story that you will get in each and every post she published. I didn’t know the author personally, nevertheless I want to recommend this to all of you especially to my fellow OFW in the UAE, for sure you can relate to her story. You can visit her blog http://dubaisally.blogspot.com/ and ready to get hook. Kudos to the author of this Blog. Good Luck and God bless to Sally, if she really exist (we never know). She is indeed the voice of every Filipina housemaid here in UAE. regular reader ako ng Sally, sinasadya niya na mag english barok pero makaka aliw ang mga post niya. reading and jumping between the entries, i realized na swerte pa rin ako kahit pa nga ‘making the ends meet’ lang ang salary ko habang nagta trabaho dito sa pinas. thanks miss ana for sharing sally’s blog. Nakita yung blog ni Sally nang ma-feature sya sa gulfnews. I have a feeling sinasadya nya yung barok english nya. I honestly think she has a nice writing style.